We build wood privacy fences and walls using Cedar. Do you live in a new subdivision with very little backyard privacy? Trying to keep your children and pets secure? Are you interested in fencing your property for more security but you don’t want a plain old chain-link or wire fence? There are many valid reasons you might want to build a proper fence around your property, and Cedar is a great choice in materials if you like the natural wood look. Alan’s Landscaping and Heather’s Gardens is a family owned and operated construction and landscape design company based out of Ottawa, ON. We specialize in the design and construction of cedar fences and privacy walls on backyard decks. From a simple privacy wall on your back deck to a 100+ feet of cedar panel fencing along the front of your property we’ll be able to provide you with a sturdy, great looking fence that will last for many years. An important thing to note about wood privacy fences is that they are often subject to local zoning and building codes. You might be limited on the maximum height of your fence, distance from property lines (called a setback) and sometimes even the style of fence must be very specific to meet home owner association requirements depending on where you live. We’ve built many different styles of privacy fencing over the years and bring a wealth of ideas and experience to the table. We prefer working with Cedar as it’s nice to work with, readily available and looks great when properly finished. We determine how many linear feet of fencing you need. We take into account the lay of your land and any obstacles. We consult with you on the materials you’d like your fence built with. We’ll provide an accurate estimate for the work including materials and labour. How Much Does Cedar Fencing Cost To Build? Cedar fencing projects are generally priced by the linear foot. This doesn’t include any fence line clearing if we need to or extensive site preparation. 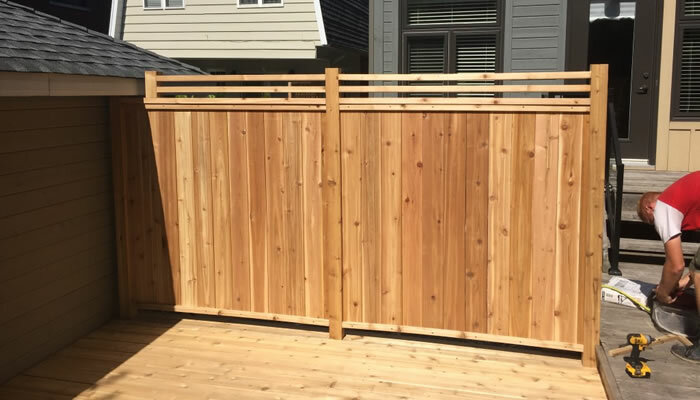 The cost of your new cedar fencing will also usually depend on the size and type of cedar fencing you choose, how many posts need anchored with cement, how many gates you have and what style (custom or stock), finishing touches such as lattice or post caps and lastly your site conditions will also play a big role in the final cost. Why Choose Alan and Heather To Build Your Cedar Fence? When you choose ALHG to build your new cedar fence or privacy wall you are partnering with a small, locally owned, family run construction and landscaping business. With Alan specializing in Construction and Heather specializing in landscape design they are the perfect team to help you transform your property with a brand new cedar fence. The ALHG team has experience building fences out of Cedar and we can take on wood fencing projects of all sizes. You can have the peace-of-mind knowing we’re still small enough to give your fence build the specific care and attention it needs to make the big impact on your lifestyle and curb appeal that we’ve promised. We believe in providing great service and value along with complete customer satisfaction with every project we complete! We will conduct ourselves like true professionals on your property at all times, leaving no trace behind but your beautiful new custom compsite deck! If you’d like an estimate to design and build a new composite deck on your property please give us a call (343) 262-4769 or fill out our contact form and we’ll get right back to you.